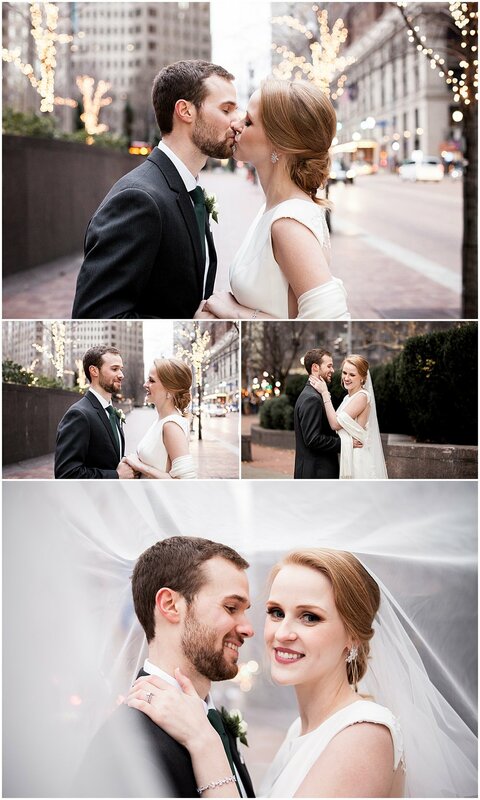 Abby+Tyler’s winter downtown Pittsburgh wedding at the DoubleTree by Hilton Hotel & Suites was a day filled with lots of laughs and classic romantic touches! Abby and Tyler met in nursing school during their senior year when they were living on the campus of the hospital, as there were designated apartments for nursing and medical students. They had a few classes together during their four years of college but didn’t meet until senior year. While living in Hershey there was such a small number of Penn State students that they became close friends during that last year! So how did Tyler propose to Abby? They decided to take a hiking trip while living in Hershey,PA. They hiked to the top of the trail and to their surprise there were several people there. So, Tyler tried to take Abby further up past where the trail ended. It was very steep and Abby is admittedly clumsy, so she was slightly frustrated and also nervous. Eventually, Tyler changed his mind and while on the way down the mountain, he stopped because there was “something in his shoe”. Thinking nothing of it Abby started taking pictures of him while he was sitting on a rock, and when she put her phone away; Tyler took the opportunity to get down on his knee! They didn’t want anything too holiday cliché and chose to keep the details simple and elegant. Abby wore an A-line dress with lace back while Tyler was dressed in a traditional suit. The bridal party wore forest green with touches of cream incorporated through shawls. I love when brides include a cover option for the ladies, such as shawls or faux fur wraps! The wedding day took place right downtown at the DoubleTree. To my surprise the hotel features some remarkable mid-century design (my favorite). The furniture and lighting could have come right from the set of Mad Men. 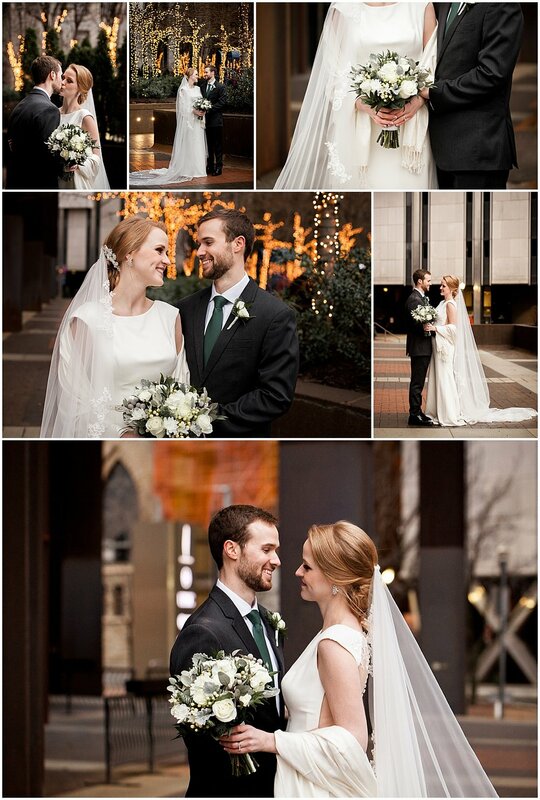 This décor pleasantly complemented Abby and Tyler’s classic wedding wear. Being that this was our last wedding of 2018, it was the perfect way to end out our season! Jp and I closed out the evening by taking Abby+Tyler to the rooftop for some seriously magical cityscape night portraits. We couldn’t have dreamed of a more exciting way to close out the year! Congrats to these two sweet souls!